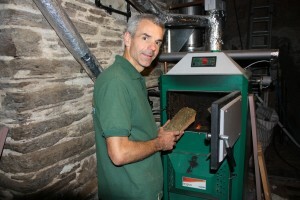 Biomass boilers for space heating and hot water use pellets, logs or wood chips. With the RHI (Renewable Heat Incentive) funding, installing renewable technologies like pellet stoves and log boilers have become the cost-efficient choice for homes and commercial properties that used oil. A log boiler heating space and hot water for 2 houses. We installed it in a barn that links the houses. Logs are the least processed and cheapest fuel. The trade off for being the cheapest is some manual work; the stove has to be lit and fed manually once a day in the winter. To minimise the manual input we recommend a large hot water vessel, an accumulator, is installed that can store enough heat to keep your water hot and house warm all evening as well as heating up again in the morning. Pellets can either be manually or automatically fed into your boiler and although more expensive than logs, cheaper than heating with oil or electricity. The major benefit to the pellet stove is the automatic feeding into the stove, leaving little manual work. The pellets take up less storage space so are most used in domestic installations. Wood chips are another low cost fuel. The wood is mechanically shredded into chips and fed automatically into the boiler. Generally used in large systems over 80kW (domestic boilers are anything up to 45kW) the wood is chipped on site requiring a larger system. The RHI has been introduced by the Government as an incentive to increase the use of renewable technologies for space heating and hot water. Read more about the Non-Domestic RHI and the Domestic RHI including current tariffs.